There’s a trend going around a lot of the natural family/organic living circles. This trend is to STOP using shampoo (or conditioner) in order to avoid all the chemical ingredients. I’ve heard about it. I’ve read about it. I’ve THOUGHT about it. And I finally decided that there were too many crunchy mamas blogging about it to not try it out for myself. For the last year, I’ve been trying to limit my shampoo usage anyway, as it dries out my hair and makes it really brittle. My friend Laura also suggested to me that curly-headed people do better by only using conditioner—another reason I began to limit my shampoo usage. Still, I fight with my hair quite a bit. I fight frizzies and my hair going flat. I usually have to wash every three days. 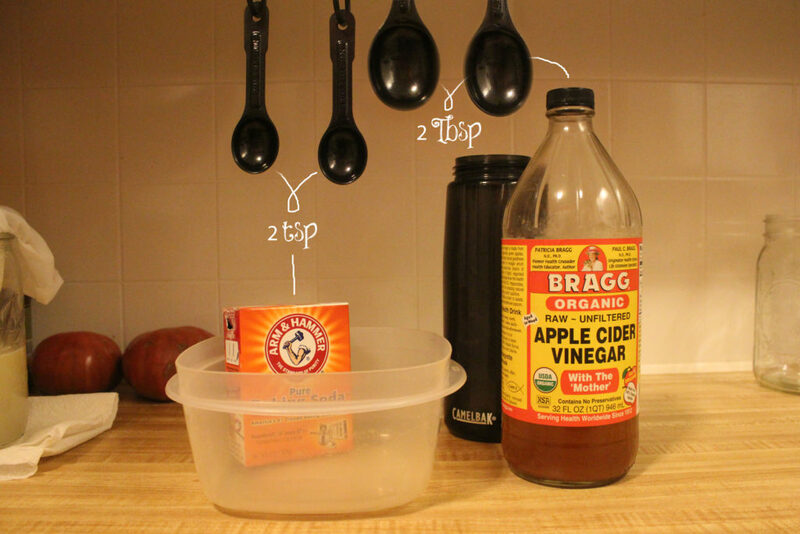 BAKING SODA + APPLE CIDER VINEGAR. I took 2-3 tsp. of baking soda and put it in a medium sized tupperware. Then I poured approximately 2 Tbsp. of apple cider vinegar into my Camelbak bottle. At the beginning of my shower, I filled up the baking soda tupperware with warm water. Some people prefer to make a paste and rub it in, but I have SO MUCH HAIR that this just seemed daunting. So I made baking soda/water solution instead and dipped as much of my hair into it as possible. Then, I poured the rest of it over my head—slowly—to get all the roots. I left this in while I washed the rest of my body, and then it was time to rinse. I filled up the Camelbak all the way to the top with warm water (about 24oz. water + 2 Tbsp apple cider vinegar), and then I poured this through my hair to rinse out all the baking soda solution. I’ve heard that you can add tea tree oil to this process, as well, which I’ll probably try in the future. To my surprise, my hair felt AMAZING. I went into this experiment with no expectations. I actually thought my hair would feel dry and frizzy because I wasn’t using conditioner. On the contrary, my hair is SOFTER and SHINIER than it has ever been. Also, HUGE PLUS, but I didn’t need to use any mousse or product to tame my frizzies. Because I didn’t use any product, my hair isn’t weighted down and hasn’t gone flat. Frank tried this a day after I did, and he likes it as well. He says his hair feels softer than normal. I’m really happy that this worked for many reasons. (1) It’s all natural, and there are no added chemical ingredients. (2) My hair feels better than it ever has. It feels lighter, more voluminous, not oily and super soft. (3) I didn’t have to use any product. Do you know how much mousse and anti-frizz costs?? Especially when you go through it like I do? I’ve got A LOT of hair. Not having to use any product is going to save me SO much money! (4) Speaking of money, you know what else is cheap and abundant? That’s right, baking soda and apple cider vinegar. 12 lbs of Arm & Hammer Baking Soda: $7.57 – cheaper than a bottle of shampoo, and enough to last for over 575 washes. If I wash my hair every 2-3 days, that’s going to last me around 4 years!! Did this leave an unpleasant scent in your hair? Did the ACV leave your hair smelling like vinegar? Trying this – are you supposed to then rinse out the vinegar? I have to wash my hair every day and sometimes twice a day in the summer. I have very fine straight hair with bangs that get oily about halfway through the day. Do you think this method would work for me? How do I keep my bangs from getting oily? I don’t even moisturize or wear make-up on my forehead? You’re probably getting really oily from all the washing you do everyday. You’re scrubbing away all of the natural oils your scalp produces and everytime, it’s saying, “AHHHHH. NOO. I NEED TO PROTECT MYSELF. MUST MAKE MORE OIL.” So try switching to washing your hair every other day. It’ll take a while to get its oil-production-stuff back on track (which will include some days of really oily hair) but just ignore it! Most people make this mistake. Listen to what your body (and scalp) is telling you! Wow. I may have to try this. I have horribly frizzy hair, comes with the wavy thickness of it all. Will be great to save money on product that really doesn’t work all that well anyway.